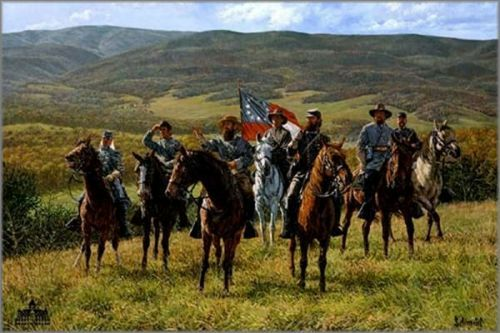 Bradley Schmehl limited edition print on paper:"Reconnaissance at McDowell - The Valley Campaign"
About the Art:The Shenandoah Valley. May 8th 1862. Jedediah Hotchkiss, 'Stonewall' Jackson's cartographer, has led the general to the spur of Sitlington's Hill to show him the deployment of the Union's infantry. The men look down over the town of McDowell, which is crowded with Feds. Shortly, McDowell is to become a small victory for Jackson - a victory that was desperately needed by the South.